I'm really proud of this set, because it's basically a set of dungeon sections that I would have killed for as a teen. As a result it's become a nostalgic journey into 80's floor plans and board games. I plan to keep providing extension sets and the odd free page to supplement it. We're chatting in general about this range here (click) but feel free to add comments of suggestions or ask any questions about the product in this thread. I originally found this set back when it was sketch ideas on a forum (this was some time mid-late last year) there were also some sketches/simple colorings of some very gothic scifi corridors in that thread... I had downloaded the original sketch versions but we delighted to see these reach commercial release! I love the retro/hand drawn style. You and the guy from Fantasy Cutouts are doing a great job in this area. Thanks so much for designing and sharing these... they will make excellent use for some good old fashioned Dungeon Crawling and Hack n Slash nights at the table. They put me in the mind of the old Heritage Paint n PLay sets like Crypt of the Sorcerer and Caverens of Doom. Floyd, Fantasy Cut-outs Leo Hartas's Hovel is truly awesome and I think I have a long way to go before my fat ink lines match the delicate intricacies of his work. Incidentally, do you think they would be a market for Gothic Sci-fi floor plans? - or at least a following for a set of free Goth-Fi plans? I'd say if they are anything like those sketches I saw... watch out... ! yes. Absolutely. 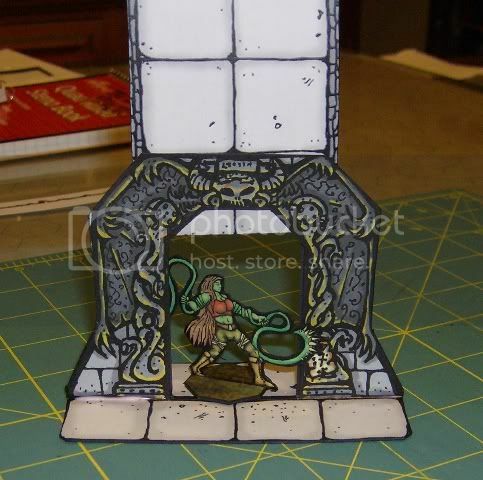 I cannot think of any hand drawn SciFi corridor/floor sets on the market right now... And it would definitely kindle that old school Warhammer Quest/Space Hulk 1st edition nostalgia. Test the waters like you did with your Fantasy Freebies... I think you'll find a pond full of hungry fish. My kids are thoroughly enjoying the Basic set! I was wondering if you'd be able to put up some pictures of how you envision the use of some of the natural hazards? my kids and I have some ideas, but were really wondering how you would use them. Floyd, I think I'm certainly going to have to try some goth-sci-fi pieces. Some of the natural hazards can be used in the rooms - larger bridge and chasm features may require two room halves where the rooms terminate as if running to a cliff edge. I'll mock something up soon. Unless you want to? I'll dig around and see if I have those pics somewhere on my HDD. By the way, thanks for the new doors! 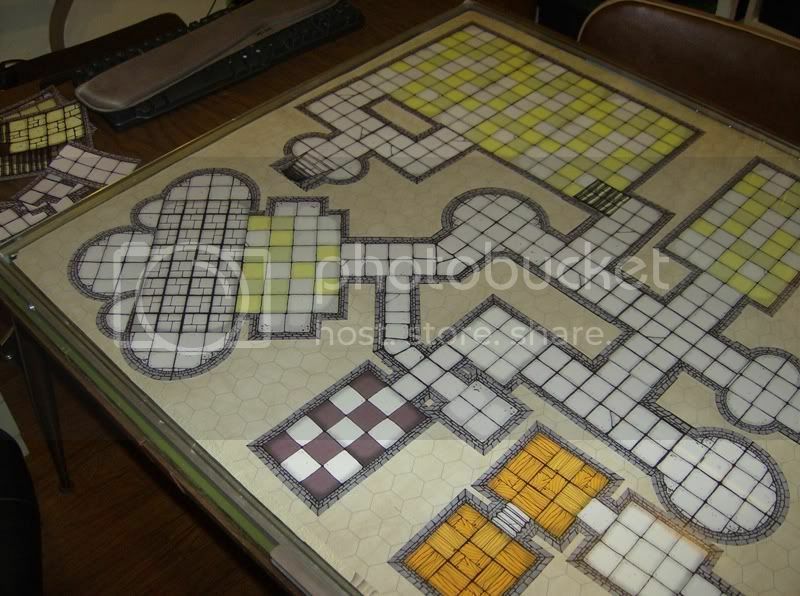 I'm getting ready to run a dungeon crawl and decided to put this tile set to work. I found it to be pretty versatile, though I only used it to generate the floor plan. My players have a map, but I still prefer to furnish the rooms as they enter them, plus I have quite a few 3D props to use. 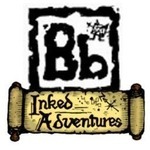 Anyway, for those that are interested in seeing a Inked Adventures, dungeon level here you go. Sammo, just is just amazing. Looks great under the glass. I really like how you are using the curve corner pieces - it really gives the dungeon an architecturally sophisticated look. I want to fill those alcoves with statues and fountains. Also, it's great to see that you're chopping up the rooms to customise make your own sizes which is what I hoped people would do. Have you spotted any obvious flaws I should know about? Anything too fiddly or redundant? Any wastage? When it's ready, I'll post a medium to large chamber with standard corridor grey flagstones here. Feel free to use these photos however you want. Nothing was really too fiddly to work with. I found that working with some of the smaller pieces it was easier to use glue sticks/tape and make a new larger piece to uses (the corridor with the half round alcoves is now all one piece, as are the 10’x10’ cells with the transition piece). Also the large rooms are one piece. I figure if I make a new room or two and a special stretch of corridor each time I set up I’ll have a decent library after a few dungeon runs. If I had any complaint it would be that the transition pieces are just too small to handle easily and I’ll ruin some of the versatility if I glue them to the rooms. For the most part I’ve been just having the corridors overlap the rooms to make the doorway, but when I need the transition piece it’d be easier to handle if it had a few extra squares on it (one row inside the room and one outside). 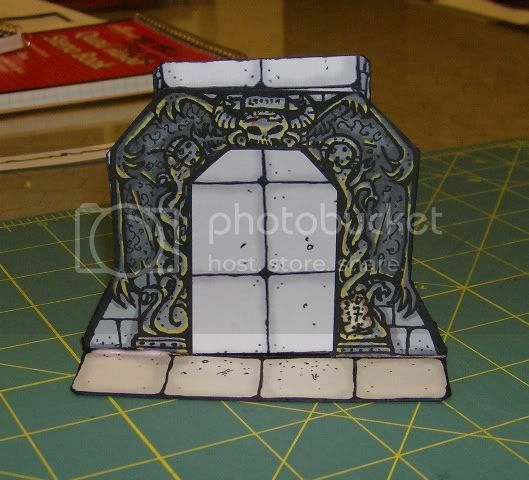 I may glue some transition pieces to some plain interior tiles and make my own. That’s a pretty minor issue though. As for coloration, the only thing that stands out to me is the flagstone which looks so much busier than the rest of the tiles. I like the two tone of the sandstone/grey rooms. I’d like to see some corridors with the same color scheme. Or the same rooms (and corridors) set up with the same light grey color but have the alternate color be some kind of grey-blue color. That’s my two cents worth anyway, keep up the good work. Excellent suggestion about the transition "connector" pieces - in one print test by friends online they were relatively ignored - longer pieces is a great suggestion. I think I was being too controlling about the 3D effect of the walls, but the practicality of use must prevail! Certainly, I'll post some uniformly coloured rooms here soon, but I may just have to be sneaky and save different colour corridors for different sets - proper sandy biege for pyramid tombs (although the walls may have to be changed), blue for "cold" dwarven halls maybe. And very nice job Sammo that looks great. This floor plan worked out well for the dungeon crawl. 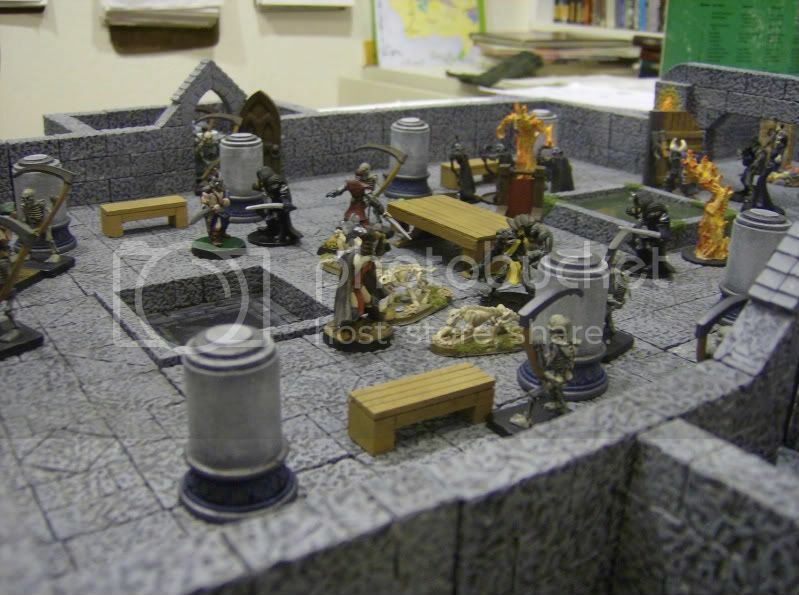 My players are currently hiding behind a wall of iron trying to rest for H.P's and spells before heading down the stairs on our next game night. I've made another few pieces and will lay out level 2 soon. I'll try and remember to take some pictures to share when I get it laid out. More round tiles (maybe a six and eight inch round) and a quarter round that could be combined (four times) to make a large round room (12 inches or so) for like a wizards tower. I like the fact that you're really pushing the rooms to their limit. I especially like the fact that you've adapted the diagonal corridors into room walls. Octagonal chambers were going to be a feature of a special map pack at some point. Here's that large room with corridor grey tiles. It's a bit of a rush job and I had to resist adding any colour variation. I'll be adding it to a special section on my website soon devoted to Visual Errata and product support (something like that). I don't plan to revise the Basic Pack until next year. In the meantime I plan to post this and the Stairs page - which currently lacks shadow. I'm just in straightforward denial about the typos in the introduction. So your players believe a wall of iron can protect them? - mwhawa. Thanks for the room update! As far as fiddly stairs on a round tower go. I'd be happy with a 4 inch curved tile that just shows the landing. But I suppose I may be putting your tile to the test as far as floorplans go, I'm not really diving into the features. It was actually good timing for me when you released this set. 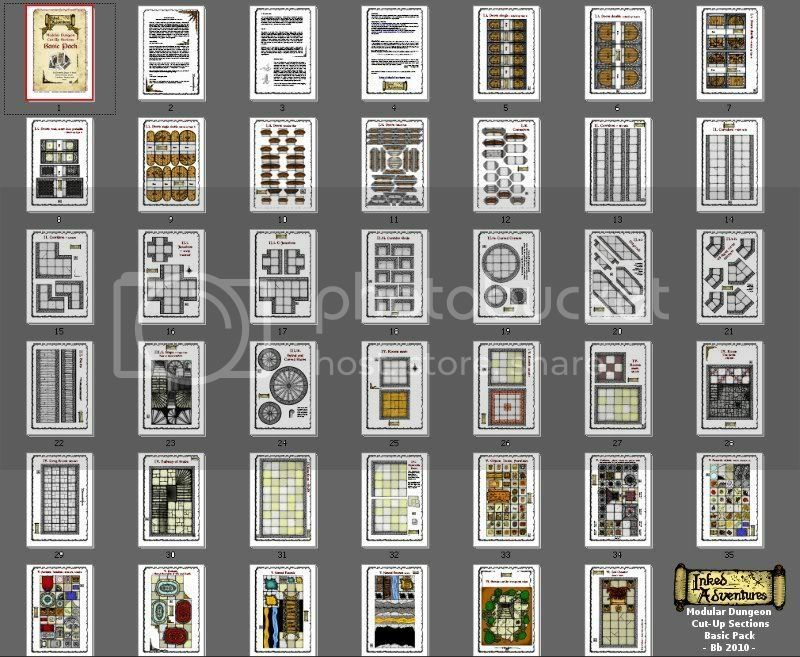 I've got a few dungeon tile sets and I was gearing up to do a big print run to make a modular set for all my dungeon planning. Glad I din't do it 2 weeks ago, because I love this set. You do realise that I draw these sets because I can't afford the 3D stuff or have the patience to work with moulds? The amount of ink used in printing these sets can be a little shocking. I recommend plenty of planning. Or printing in greyscale, where possible. Thanks again, for my first "massive" dungeon level example. I picked up your huge dungeon door add-on. Here are some pictures (I added a slider to make it a huge stone slab door). 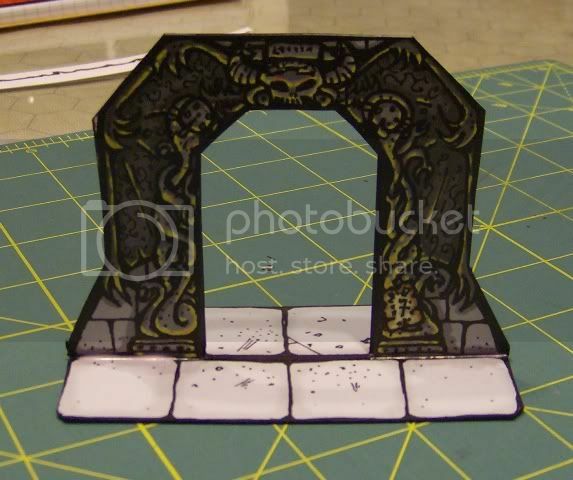 Hey Sammo i like your big dungeon door. It´s great! But all I did was build it, all the awesome artwork is Billiam Babble's. I'm glad to see it adapts well to being a sliding door. I may have to develop that. I've added a (large) Curved Section supplemental page to the free downloads on RPGNow - another quarter circle. Six square radius. I think I'll work on a proper wizard's tower or some sort of "broch" pack with steps at a later date. Hey, late to the party. So does this include pieces to build custom size/shape rooms? This is EXACTLY what I have been waiting for the "big" guys to do but somehow never got done. Flat, walled dungeon tiles. I picked up the round room section (thanks for the awesome free add on). It looks great I can't wait to get some in print and on my table. Though my players' adventures are keeping them above ground for the moment, rest assured there will be at least on large round room the next time they head underground. BTW if you want to use any of these photos go ahead, it's all your artwork anyway. 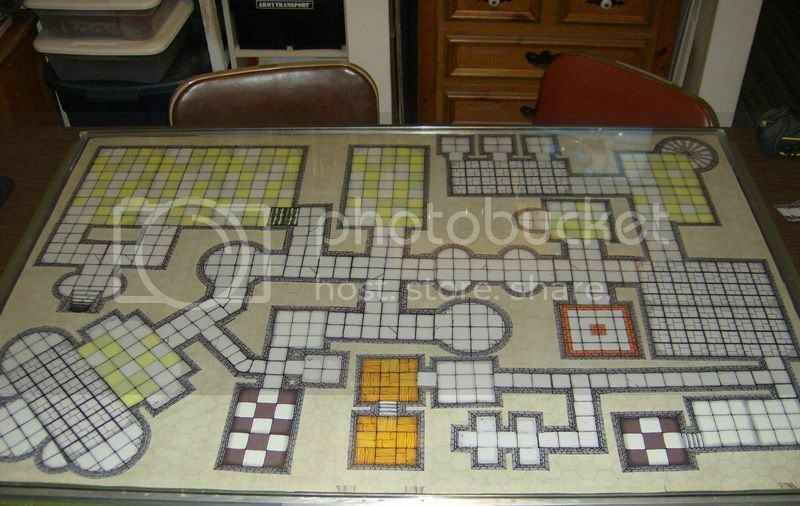 Planning on picking this up, but one other question; how do you connect the pieces? I was planning on using them free-floating and see that if you have doors in place, you could use paper clips to hold them together, but if their is no door or archway...how would you hold them together? I'm not sure if Billiam Babble has a specific solution, but as far as I could tell you could still use paperclips even without the door sections. Since all of the rooms are walled in you have to overlap the corridor to cover the wall to make the doorway, it would leave enough room to slide a paper clip and hold it together. 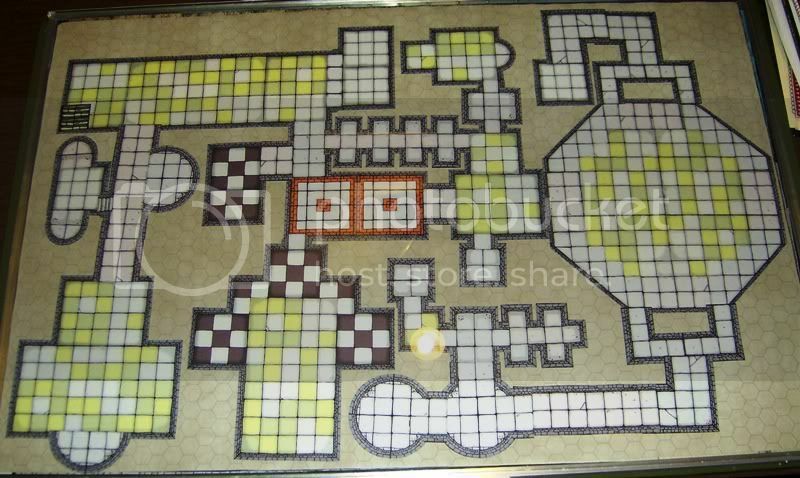 For the corridors you could just have a one square overlap to give yourself enough room to clip them together. I mount them to Artboard (a thicker cardboard found in hobby stores). 2. the artboard adds a rough underside to grab onto my felt topped playing board. It works rather well and looks mighty fine too!